Father Deo was born on 8th August 1953 in Tanzania, East Africa and ordained priest on 20th December 1980. He studied Theology and Religious Studies at the University of Bristol and Moral Theology at the Accademia Alfonsiana in Rome. For 15 years he was a parish priest in his home diocese of Mahenge, Tanzania. Following that he became Treasurer General of the diocese for three and a half years and then Director of Formation for four years. Prior to his appointment at St. Bartholomew's Father Deo had worked in the parish of St John the Evangelist, Gravesend from 2008. He also studied Ecumenism and Scripture in Jerusalem for one year. He was appointed Curate at St. Bartholomew's in 2011, and Parochial Administrator in 2013. Fr. Innocent Chibueze Ezeonyeasi was ordained on the feast of St. Bartholomew, 24th August 2002 for the Catholic Diocese of Orlu, Imo State, Nigeria. He celebrates his birthday on 3rd of January. 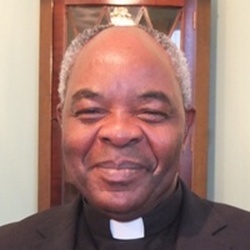 Before he came to the United Kingdom, he worked as Assistant Parish Priest, Parish Priest, Principal, Chaplain to Orlu Diocesan Mass Servers’ Association, Diocesan Liturgical Master of Ceremonies, and the founding Chaplain to St. Camillus Catholic Chaplaincy - Imo State University Teaching Hospital, Orlu. He was appointed Assistant Chaplain to the Nigerian Catholic Chaplaincy, England & Wales by the Catholic Bishops’ Conference of Nigeria (CBCN) in collaboration with the Catholic Bishops’ Conference of England & Wales (CBCEW) in April 2009. He became the Principal Chaplain to the Nigerian Catholic Chaplaincy, England & Wales in January 2016 and ended his appointment in the Chaplaincy in December that year. Fr. 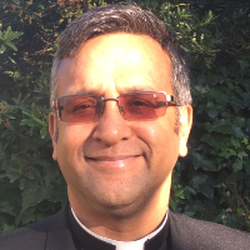 Innocent was appointed Assistant Parish Priest at St Bartholomew’s Catholic Church, Norbury on the Feast of Our Lady of Lourdes, 11th February 2017. Academic Qualifications: Masters in Arts, Psychoanalysis (M.A), Bachelors in Theology (B. Th. ), Bachelors in Philosophy (B. Phil). He is the author of The Sanctuary: A Handbook for Altar Servers (2005), Altar Prayer Companion (2008), The Stations of the Cross - A Diaspora Experience (2010), Channels of Prayer (2013) and Introducing the Marriage Meter (to be published in September 2018). He organises programmes and workshops to assist youths and adults develop skills for Christian friendship and commitment in marriage. He loves Our Lady the Blessed Virgin Mary and is a promoter of Marian spirituality according to St. Louis Marie de Montfort. Deacon Ged Perkins was born in West London but he has lived in South London for the majority of his life. Initially he lived in Brixton Hill where he attended St. Bernadette’s Infant School and St Bede’s Junior School. He then went to Bishop Thomas Grant RC Secondary School in Streatham. It was whilst Ged was at BTG that his parents decided to move to Norbury in 1975. It was during this period that Ged joined the various activities that the Parish offered – he was a part of the 32nd Scout group and the St Bart’s football team where he played football under the guidance of the ‘legendary football coach’ Eddie Sanders. After school Ged went into a career within local government working on frontline services at two London Boroughs. He still works in local government but with a national organisation which works with all local authorities in England & Wales helping them to manage the delivery of their services within an ever-changing environment. Ged is happily married to Kathy. They have been blessed with two sons Nathan & Theo (their names mean ‘Gift of God’ in Hebrew and Greek) both of whom went to St James the Great and St Joseph’s College. It is through their influence that Ged became a football coach as well as a foundation governor at SJG with the hope of giving all children at the school the opportunities to excel. ​Fr Tom Cooper (prompted by Maria Lopeman). All of these factors alongside Deacon Paul’s Vocation Homily were strong influences in motivating him to make an enquiry about the permanent diaconate. A wonderful journey which culminated in Ged being ordained a deacon on 17th June 2016. Ged is enthused by Pope Francis’ words "…holiness doesn’t mean doing extraordinary things but doing ordinary things with love and faith". Therefore, through God’s grace, Jesus Christ’s inspiration and the Holy Spirit’s guidance, Ged hopes to serve wider St Bart’s community for many years to come.